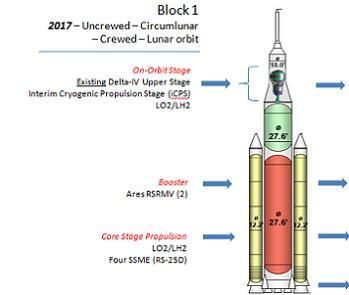 The Space Launch System (SLS) is undergoing final refinements – known as trades – on a preferred baseline for the opening flights, with documentation showing a preference to debut the Heavy Lift Launch Vehicle (HLV) with four RS-25s on the core stage, instead of three. Should this become an approved configuration, it would allow for full utilization of the propellent that can be contained inside the stretched core. The ongoing trades taking place at the Marshall Space Flight Center (MSFC) are a notable change from the Constellation Program (CxP) issue of making major configuration decisions years down the line, which – in the case of Ares – was well-known as one of the contributing factors to causing impacts to the entire vehicle. Technically, SLS could launch with three, four or five RS-25s from the outset. However, with three engines on the core, and the automatic need for the core to be “stretched” – based on the five segment boosters on the configuration – using four engines will allow the vehicle to fly fully fueled in all configurations saving the extra calculations/testing for an under-filled three engine core. As such, it appears managers have already decided that using four engines on the first stage would be best prescribed for the SLS from the start. Revealing details of the core stage discussions, a “face-to-face” outbrief in late September resulted in a highly detailed presentation (acquired by L2). The meeting involved SLS operations personnel and Mission Operations Directorate (MOD) departments. 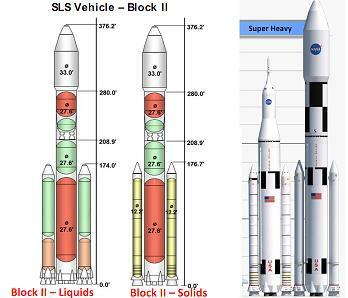 In the presentation’s SLS Overview, the Launch Vehicle Blocks are shown in three configurations, namely Block I, Block IA and Block II – the latter of which is the fully evolved 130mt launch vehicle. The Block I vehicle has two missions, opening with the flight to send an uncrewed Orion (MPCV) on a Circumlunar trip around the moon, followed by a crewed lunar orbit mission. While schedules are still being worked, managers are aiming to launch SLS-1 in 2017, followed by SLS-2 in 2019. Block I uses a Core Stage Propulsion of LO2/LH2 with Four SSMEs (RS-25Ds) now sported by the configuration, an advance on the three RS-25Ds, as previously noted. Core Stage Tank design (structure, MPS (Main Propulsion System), avionics) will be used for all subsequent SLS flights. Tanks, MPS, and Engine interfaces will be sized for 130 mt vehicle. Engineers are also in the final stages of completing the list of hardware that will be removed from the aft of the retired orbiters, ahead of being donated to the SLS test program and flight hardware. As already well-known, these two Block I flights use the Ares Five-Segment configuration. These Solid Rocket Boosters (SRBs) will not be recovered from the Atlantic. Also confirmed by the presentation, after first revealed by this site, the On-Orbit Stage will utilize the existing Delta-IV Upper Stage Interim Cryogenic Propulsion Stage (iCPS), driven by LO2/LH2. Also known as the kick-stage, this is a temporary measure ahead of SLS’ purpose built hardware. 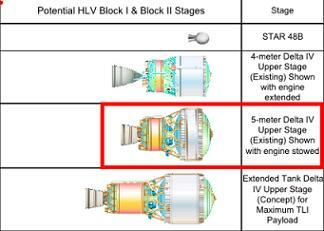 “iCPS (Delta IV) will be used for two flights: Originally planned to be used with no s/w (software) mods. Current thinking is that s/w mods will be required. Requires Delta IV flight computer redesign. Will include the following four commands: Authority to Proceed. Engine Shutdown. Upload Burn Targets. State Vector Update,” added the presentation. Block IA will then take over, providing the mission configuration for the bulk of the 2020s, from SLS-1 to around SLS-13. This configuration will have the same appearance as the Block I, bar the Cargo version, which will debut after the Lunar missions. The core will again utilize RS-25s, although it will first use up the stock of SSMEs (RS-25Ds), of which the presentation notes there are currently 14-15* in total. This figure includes the three sets of three donated by each of the Shuttle orbiters, and a spare set of three which were already held at the Kennedy Space Center (KSC) in the event of a pad changeout. *Note, other L2 documentation state the number is 15 engines, plus two development engines, and an additional spare Line Replacement Unit (LRU). Due to the core’s engine configuration, an advance on the four engines can be made – moving to the full utilization of five RS-25s on the core – as is noted by the overview of the Block IA, which acknowledges this version of the SLS will be when the program eventually moves on to the cheaper, expendable RS-25Es. “Core Stage Propulsion Four-five expendable RS-25E. Develop expendable, cheaper version of SSME for on-ramp when the existing Shuttle inventory is used up (~14-15* full SSME’s),” noted the presentation, overviewing what will be a 100mt capable launch vehicle. Most of that additional power will come via the debut of the new “advanced” boosters, which will be decided via a “competitive procurement”, resulting in either ATK winning through with a more powerful version of their Solids, or a switch to a liquid booster, likely to powered by RP-1 (Kerosene). 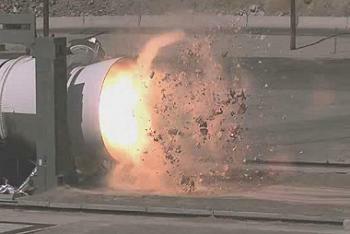 (Image taken from the amazing 220mb DM-2 Five Seg Motor Ground Test Video – available in L2). 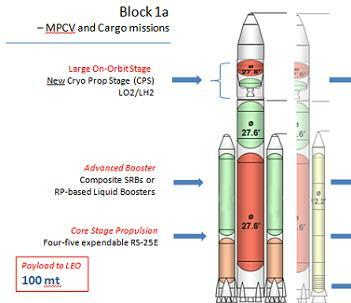 With the Delta IV kick stage no longer required, the Block IA will be prepared to host the “Large On-Orbit Stage”, a new Cryo Prop Stage (CPS) driven by LO2/LH2, pointing to some flexibility of missions prior to the fully evolved SLS being ready. “NASA designed on-orbit stage. Not part of SLS vehicle. Paid for by SLS Program. Enables Exploration missions,” added the presentation, which may be pointing more towards it being too early to know when the CPS will be used. “Utilizes Avionics independent from SLS. Then comes the massive 130mt, fully evolved, Block II SLS, which will be a nature advancement on the Block IA configuration, with the only difference being the size of the vehicle, as it grows by nearly 80 feet – when compared to the Block IA cargo vehicle – to find space for the new Upper Stage. Using three J-2X’s from the Constellation Program, development of the engines and stage will continue alongside the SLS work, prior to being held back until the Block II is ready to fly. This, as NASA have been claiming for some time now, will be the flagship launch vehicle that will send humans – and their supporting hardware – to Mars. While less technical than the presentation used in the above content, a superb 48 page industry-level overview of the SLS has also been produced (and acquired by L2), which provides some of the first real mission capability overviews and industry base benefits for the SLS. This will form the basis of the next SLS article on this site.